Someone who has never attended Woodstock School may legitimately wonder why anyone would wish to send their child there. I went to Woodstock in 1977 because I had no better educational choice (except to continue with correspondence school in Bangladesh, where my parents were living and working – a year of which had already been more than enough). “No other choice” was the case for many Woodstock students in those days, when jobs in development, missions, or international business were more likely to send Westerners overseas, and there were fewer international schools in odd places around the world for their kids to attend. Woodstock nowadays is one of Asia’s elite schools, preparing students for still-much-desired admission to universities in the US and UK (as well as Asia’s own top universities). But it’s not so obvious why any student should come from outside of Asia. And there are plenty of reasons not to. Let’s look at some of those first. Secondly, Woodstock is in India, specifically in the small town of Mussoorie, 7000 feet up in the foothills of the Himalayas. A location which, much as I love it, is what the foreign service used to call a “hardship post”. It’s cold and wet during the monsoon, cold and sometimes snowy during the winter (though fall and spring are gorgeous and not too hot). School facilities and infrastructure are enormously, unrecognizably improved since I attended 25 years ago, but most of the buildings are still old and unheated, many cannot be reached except on foot, and the overall level of comfort is well below what we in “the West” are accustomed to. On the other hand, India has very good health care these days – so good that people are travelling from the US, Canada, and UK to have non-urgent surgery and other treatment far more cheaply in Indian hospitals than they could at home (“medical tourism” they call it, and it’s a booming business). …and there are plenty more aspects of India that the average Western parent inexperienced with Asia will find frightening, bizarre, and incomprehensible. But let’s not dwell on them for the moment. At a Woodstock reunion long ago I talked with an older alumnus whose own children were then college age. “How come your kids never went to Woodstock?” I asked him. He explained that his daughter had done very well at home in Canada, was well-adjusted, made good grades, had lots of friends, etc. He had never even considered sending her to Woodstock, because there was no reason to take her out of her happy situation. His son, on the other hand, had had both social and academic problems at school, and didn’t seem to be going anywhere with his life after high school. The alumnus thought his son might well have benefited from Woodstock, as a total change of scene if nothing else, but his wife would not hear of it: the idea of sending her son off to school in India was just too strange and scary. The alum regretted that they hadn’t tried it. Do you have to be among the walking (psychologically) wounded for Woodstock to do you good? Of course not. Plenty of healthy, well-adjusted kids have gone there and enjoyed it. The Woodstock environment is nourishing and nurturing for just about everyone. How and why it is this way is a topic for a much longer article! At a reunion in London in 2003, I met the parents of a German boy who had just gone to Woodstock for his junior year abroad. The parents had travelled to London to meet alumni because they knew very little about the school or the people it produced. How on earth did their son end up there? He had been doing well in school in Germany, but was not satisfied with the level of English he was learning. (I assume that his father, an international businessman, had drilled into him how important it is in today’s global world to speak good English.) So the boy wanted to go to a school where he could study in English, but exchange programs in the US or Canada did not appeal to him (possibly for the same reason – no choice of the actual school – that similar exchange programs from Italy did not appeal to Rossella). His father, whose business took him frequently to China, suggested that he look for a school in Asia: “Asia is the future,” he told his son. The boy did a search online, and came up with Woodstock. His father stopped by for half a day on one of his China trips, approved of what he saw, and off the boy went. I believe he stayed there a second year as well, and graduated with his class. Unusual? Certainly. Weird? Maybe. But the father had a point. The Economist recently stated that “India may overtake Germany as the world’s fifth-biggest consumer market by 2025.” The future, indeed. 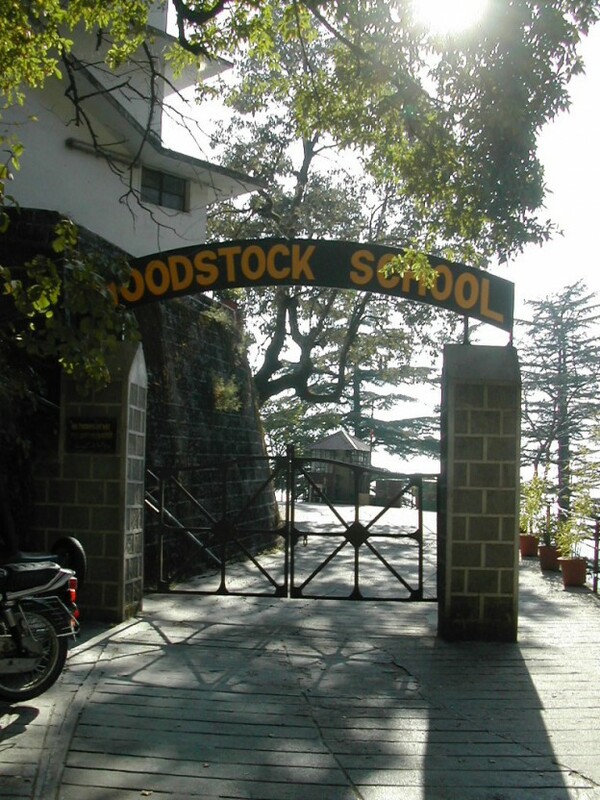 Many alumni and former staff gathered in Mussoorie to celebrate Woodstock’s 150th anniversary in 2004, some bringing family. My classmate Deepu’s daughter said to her afterwards: “I see you with all your old friends and hear the great stories you tell. When I’m old, I want to have stories like that, too.” She has now been at Woodstock for several years herself, and presumably has her own friends, and stories to tell with them. This entry was posted in Woodstock School and tagged Italian culture, Woodstock School on June 1, 2007 by Deirdre Straughan. One thing I think you mentioned at one time was the attitude at the school towards the GLBT community. Could you run through that again? We just finished hosting the Indian film maker Shyam Benegal here in Seattle. His wife Nira is a Woodstock alum. Just thought I’d mention that. Having gone to Woodstock in the last decade, I can bring another viewpoint to the table. When I was there, the rules were quite draconian and students felt Christianity was being “shoved down out throats”. Two interesting examples to back up the last point. When the Dalai Llama visited, a member of staff protested him visiting because it was a “Christian school”. Also, some members of staff were not only joyous upon a Christian conversion (the class president in 1997 or 98 I believe was converted from Buddhism), but punishments were metted out differently between those who volunterily attended Bible Study and those who did not for the same infraction. You get an excellent academic education, but considering the fees paid, the sports facilities of the school, along with the food (they were spending about Rs 13 for dinner on average per student) were quote atrocious. I’m an alum who dreams of sending my children to Woodstock. They are still in primary school at this stage and I would love for them both to attend when my eldest enters high school. After my sister and I graduated from Woodstcock, my cousin was os convinced of the valuable education there that she put her three sons as well. My concerns for putting my children through Woodstock are finance. How much will it cost and is there any sort of financial assistance available? When do I start contacting admissions as I know that it took my parents a good 2 years to get us admitted and my poor cousin struggled for 3 plus years for her sons’ admission. I loved my year at WS and hope to return as a teacher one day. I dream of being in such an international community again (and seeing my grandparents!). I really hope you can go – the fact that you want to, in the face of incredulity, is already a sign that you’re likely to enjoy it! The school has gotten expensive, but ask about financial aid. There are or used to be at least some small scholarships for children, and I assume grandchildren, of alumni. It’s great that you’re trying to save up, but you may not need to save quite so much. I was there 1981-84, my son is there now and loving it. I do miss him terribly, though. I’m told that Woodstock’s attitude towards LGBT people has improved somewhat, but I don’t have much direct knowledge one way or the other. It would be tricky to have openly gay staff members because of India’s oppressive anti-gay laws. Unfortunately. In the years since I wrote this post, the school has continued to undergo changes (of course). Current Principal Jonathan Long, formerly principal of the United World College in India, is keenly interested in achieving and maintaining a diverse student body – a project dear to my own heart, because I believe it was one of the most important and enriching aspects of my own years at Woodstock. While the base cost of Woodstock tuition and boarding has gone up considerably, the school has scholarships intended to achieve diversity (I donated to that myself last year), and scholarships specifically to help descendants of alumni attend. So I would warmly encourage anyone who is interested to apply, and then see what kind of financial help may be available. I haven’t seen this tried yet, but I suspect that individual prospective students could also crowdfund a scholarship among alumni who know their parents. Your website is fantastic! Your candidness is admirable and refreshing. Reading your website elicits many different thoughts and emotions. I genuinely believe you would be able to write a wonderful book that might even become a best seller one day! How are you? I hope you are keeping well. I will be sending my daughter to Woodstock this year in the 8th grade. I know sending your daughter was a very different experience, but I am still curious about what your experience was like at that time. You have a wonderful site that I will show to my wife that says so much about you and your experience at Woodstock! I hope to hear from you. Take care!